With today and Friday off, I have plenty of time to enjoy the Halloween events in Guild Wars 2. One my favorite things in MMOs are the seasonal events and Halloween has always been my absolute favorite in any game I've played. So, as you can see, I took a pickaxe to a giant candy corn. To get smaller more bitesize candy corn, obviously. 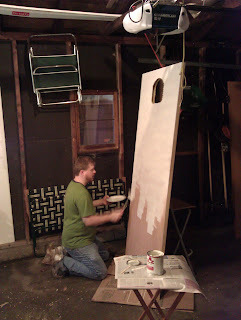 We went shopping in the afternoon to pick up the necessary components to make a cat door to the basement. We have been leaving the door ajar so the cat can come and go but it's a narrow hallway so being able to close the door and still allow the cat to come and go will be nice. As you can see, Chris was productive cutting the hole in the door and painting it. 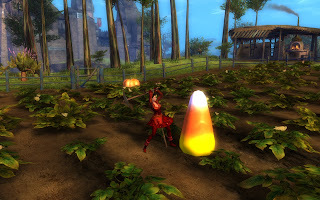 I finished up Cloud Atlas, grilled some steaks then immediately went back to enjoying more Halloween in Guild Wars 2. Fighting giant candy corn that come out of a haunted door? C'mon, how can you not love it?